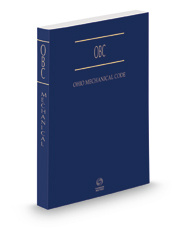 This easy-to-use volume integrates Ohio's unique model codes with state modifications. Text covers all aspects of the Mechanical Code, from construction and installation to maintenance and repair. Specific areas addressed include heating, cooling, and ventilation equipment in certain applications; hydronic, gas, and fuel oil piping; flammable and combustible liquid storage systems; chimneys and vents; and ventilation and combustion air.